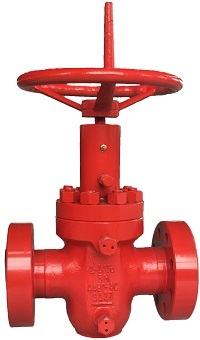 M type expanding gate valve has a non-rising stem with a expanding gate design to provide safe dependable services in a variety of environments. It is available in flanged ends or threaded ends in standard bore sizes from 1-13/16" through 7-1/16" in working pressures from 2,000 psi to 10,000 psi. Ball Screw Operator is available for large bore and high pressure gate valves. All of our valves can be actuated by hydraulic or pneumatic actruators.